The Canton Medical Education Foundation/Internal Medicine Residency is fully accredited by the Accreditation Council for Graduate Medical Education (ACGME). The ACGME is sponsored by the American Board of Medical Specialties, American Hospital Association, the American Medical Association, the Association of American Medical Colleges, and the Council of Medical Specialty Societies. 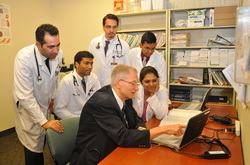 We accept applications through the ERAS for 12 PGY-1 positions annually. Deadlines for various application processes can be found on the ERAS timeline webpage. ACGME ID for Categorical Internal Medicine Program can be found on the ERAS Participating Programs webpage.